Leading off this week’s column: A giant 40-mile algae bloom sits ominously off America’s west coast like something out of a sci-fi movie. 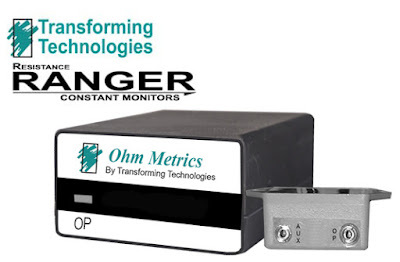 Agilent Technologies posted about this danger to marine ecosystems and what they are helping to do about it. If you were in a self-driving car heading down a narrow road, would you be tempted to take the wheel yourself? According to this post by Robotics Business, self-driving cars actually outperform humans in these situations. Laboratory Equipment magazine’s post looks at research that says the Earth was once a snowball and thawed out gradually and irregularly because of the planet’s wobble on its axis. Jono Williams of New Zealand wanted to build the best treehouse ever, but this Make Magazine post shows that he wound up with the coolest man cave ever: The 30’-tall Skysphere. Ever wonder how a PCB is made? Check out this interesting post from Electronic Interconnect Corporation. And we close out this week’s column with our post about Bevco’s 48-Hour Quick-Ship Ergonomic Chairs promo, which ends today. Save 10% off our regular price on Ergomat Dry Area Light-Duty Anti-Fatigue Floor Mats when you use our FPF082815 Coupon Code. This Featured Product Friday (FPF) promo is valid from today, August 28, 2015 through Sunday, August 30, 2015. 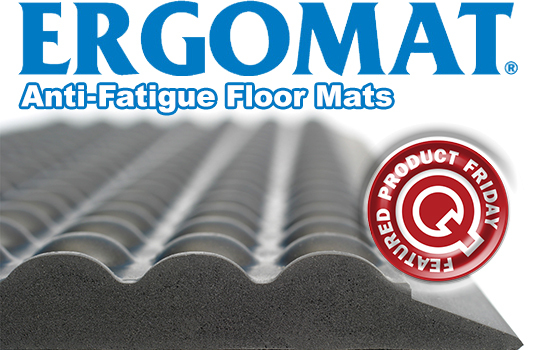 Ergomat AB Classic, Basic Bubble, and Basic Smooth mats are part of this promo. These mats are ideal for non-critical environments, dry and non-abrasive areas, and where static electricity is present. Mats in the AB Classic line are ISO Class 5 (100) cleanroom compatible. While this is a 3-day limited-time offer, the coupon is unlimited. Use the code as many times as you like while it is valid—and please feel free to share the code with your friends and colleagues. For further questions about Featured Product Friday, please read our informational blog post, call us (800-966-6020), or send us an email. Please note: This promo is valid only at QSource.com and expires on August 30, 2015. Leading off this week’s column: What did people envision for the city of the future in 1925? Workrite Ergonomics shared one person’s predictions, which were pretty darn close to reality. Ever try to sleep when you’re in the hospital? Fashion Seal HC shared this post about how hospital-instituted quiet hours may become the new norm. Robots may not be allowed to physically harm a human being, but as this New Equipment Digest post points out, they can take your jobs. A recent study predicts 68% of high-tech jobs could be taken by smart machines in the not-too-distant future. Is it time to rage against the machines or is this a classic case of robo-phobia? Everything is better (and funnier) when seen through the eyes of a child. Conductive Containers shared this video of an 8-year-old’s take on engineering. Fun video of an 8-year-old discussing engineering. Enjoy! The fatality rate from high-speed police chases has been a major issue for many years. EE Times’ post looks at a few technological pursuit termination devices that look to save lives. And we close out this week’s column with our post touting Transforming Technologies’ high-accuracy, low-cost Resistance Ranger ESD Monitors. 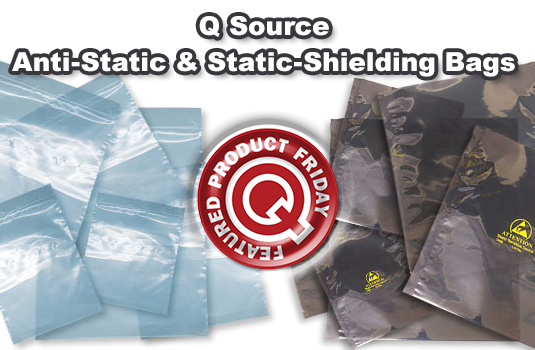 Save 10% off our regular price on Q Source Branded Anti-Static and Static-Shielding Bags (various part numbers – see Web page) when you use our FPF082115 Coupon Code. This Featured Product Friday (FPF) promo is valid from today, August 21, 2015 through Sunday, August 23, 2015. Our anti-static and Static shielding bags provide premium quality at a lower cost. Check out our site for a variety of sizes and styles. While this is a 3-day limited-time offer, the coupon is unlimited. Use the code as many times as you like while it is valid—and please feel free to share the code with your friends and colleagues. For further questions about Featured Product Friday, please read our informational blog post, call us (800-966-6020), or send us an email. Please note: This promo is valid only at QSource.com and expires on August 23, 2015. Leading off this week’s column: Agilent Technologies shared this fascinating tale of Ernst Laqueur – a pioneer in the field of endocrinology and the production of insulin, but a tragic figure just the same. BioFit shared this silly piece about a photographer, Horia Manolache, who imagined how chairs would look based on the people who sit in them. Bigger isn’t always better. Laboratory Equipment magazine’s post looks at the good (a bigger, faster canal will improve the country’s economy, and encourage international trade) and the bad (the larger canal may bring an exchange of non-indigenous species that could harm the Mediterranean Sea) of a new $8.5-billion Egyptian project to update the Suez Canal. This eye-opening post by ASSEMBLY Magazine shows that many American manufacturers are missing out on the benefits of technology because they are failing to implement or leverage important technological advancements. Drones are everywhere nowadays…not always where they should be or where we want them to be. This EE Times post look at the U.S. military’s “Black Dart” exercise to develop countermeasures against enemy-operated drones. And we close out this week’s column with our post taking a quick look at Akro-Mils’ cool TiltView Bins. Get 10% off our already low prices on a selection of Lindstrom In-Stock, Ready-to-Ship Cutters & Pliers (Various Part Numbers – See Web page) when you use our FPF081415 Coupon Code. This Featured Product Friday (FPF) promo is valid from today, August 14, 2015 through Sunday, August 16, 2015. 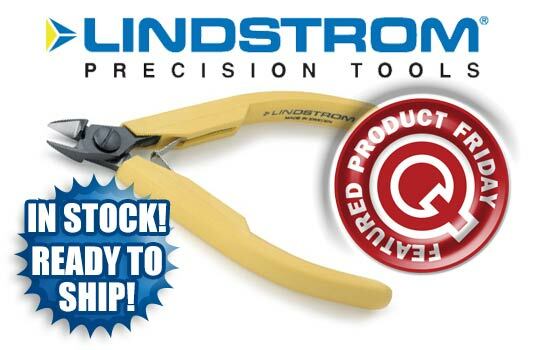 These Lindstrom tools offer the precision you need for a variety of applications. Get these ready-to-ship items fast and save with our FPF code. While this is a 3-day limited-time price, the coupon is unlimited. Use the code as many times as you like while it is valid—and please feel free to share the code with your friends and colleagues. For further questions about Featured Product Friday, please read our informational blog post, call us (800-966-6020), or send us an email. Please note: This promo is valid only at QSource.com and expires on August 16, 2015. Looking for a parts storage system that’s easy to use and offers high visibility? Akro-Mils’ TiltView® Bins are a space-saving solution for easily accessible parts storage offering clear, tilting bin cups that close securely for dust-free protection. Available in a number of sizes and with a selection of accessories, Akro’s TiltView Bins can be used on your desktop, wall mounted, or attached to steel rails, frames, or louvered panels. TiltView bins are great for use in the healthcare, manufacturing, assembly, retail, and distribution industries and for tasks such as supply room, order picking, tool cribs, and others. When closed, the clear TiltView bin cups offer quick identification of the stored parts. For fast access to the parts, the bin cups tilt out smoothly. You can also use the included card stock labels for an even quicker way to see what’s in your bins. 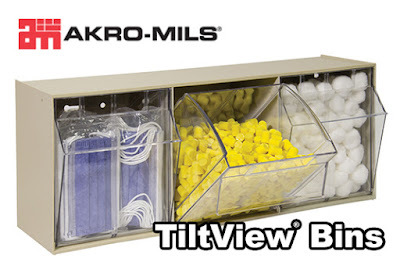 Visit QSource.com to purchase your Akro-Mils TiltView Bins. You may contact us by phone (800-966-6020), email, or via our Web site. While at our Web site, you may also want to shop our complete Akro-Mils product line. Leading off this week’s column: Brady shared this very important information about the Globally Harmonized System (GHS) for Hazard Communications. This is a must-read if your business is impacted by the GHS. AIM Solder shared some of their expertise about solder paste with this post that focuses on key issues with solder paste powder. Would you live in a shape-shifting house? Workrite Ergonomics’ post checks out a zero-energy house that moves its walls around in tune with the weather to create shade and cooling. "...Watch out when it gets hot, because your walls will be moving..."
Here’s a really interesting share from Gooch & Housego about how LED streetlights (with Web-based controls) will save the city of Oceanside, California about $600,000 a year. With the help of LED streetlights, Oceanside, CA will save some major bucks in electricity & maintenance costs. Every week we wonder where 3D printing will show up next… 3D Printing Industry posted about the first FDA-approved, 3D-printed medicine (SPRITAM levetiracetam). And we close out this week’s column with our look at our post detailing Bevco’s 48-Hour Quick-Ship Program on select chairs. Save $26.07 off the MSRP on the Hakko FA-430 Fume Extraction System (Part Number FA430-16) when you use our FPF080715 Coupon Code. This Featured Product Friday (FPF) promo is valid from today, August 7, 2015 through Sunday, August 9, 2015. 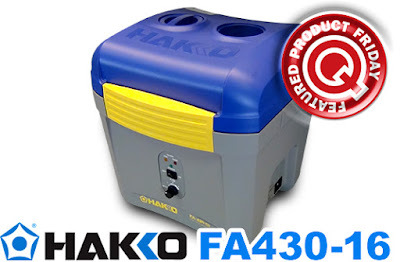 This Hakko Fume Extraction System (FA430-16-H001) features powerful suction, quiet operation, and three airflow adjustment modes. Usually listed at $625.07 (MSRP), you’ll get this item with our FPF code savings for just $599.00. While this is a 3-day limited-time price, the coupon is unlimited. Use the code as many times as you like while it is valid—and please feel free to share the code with your friends and colleagues. For further questions about Featured Product Friday, please read our informational blog post, call us (800-966-6020), or send us an email. Please note: This promo is valid only at QSource.com and expires on August 9, 2015. If you’re shopping for a quality Bevco Ergonomic Seating chair — and you need it fast — check out our Quick-Ship program before it expires at the end of this month. This promo gives you 48-hour shipping on up to 15 select Bevco 7000 Series chairs. Choose from the most popular configurations on select Bevco 7000 Series chairs and get them in just 48 hours. Eligible chairs offer AA & AAE arms options on tilt models and hard-floor, carpet, or ESD casters, but are available in black only (offer not valid for other polyurethane colors). Visit our Bevco 7000 Series Quick-Ship Program page to purchase your chairs and take advantage of this 48-hour shipping promo (for up to 15 chairs) before it expires at the end of this month (August 31, 2015). For additional information or questions about this limited-time program, you may contact us by phone (800-966-6020), email, or via our Web site. While at our Web site, you may also want to check out our Bevco 7000 Series Chairs FREE Casters promotion. Leading off this week’s column: Where do self-driving cars go to learn? Why, the University of Michigan, of course. This TE Connectivity post looks at a 32-acre city built on campus to allow the autonomous cars to hone their skills. Agilent Technologies posted about a new scientific discovery of a sixth basic taste. Sounding like a character from a Greek play, oleogustus (Latin for “fatty taste”) may be why we love things like pizza and cake so much. This Laboratory Equipment magazine post presents an encouraging story of a new polymer gel that could allow for stomach-based medical devices to last longer and pose fewer risks to the patient. The accuracy of a medical scan directly relates to the successful discovery and treatment of cancers. NIST posted about how they helped developed PET Phantoms, which are used to calibrate and fine-tune PET scanners used for diagnostic applications. The new calibration capability can be used to fine-tune PET scanners that find cancers and track the progress of treatments, among other diagnostic applications. Many people are unaware that the America’s successful space shuttle program had a Soviet counterpart that never got off the ground (excuse the pun). Mashable posted a series of photos that show these unused Russian space shuttles gathering dust at the Baikonur Cosmodrome.